The introduction of the synthetic heavy-duty diesel engine oil, Mobil Delvac 1™ ESP 5W-40, has delivered significant performance benefits for Mexican customer Construplan, including the reduction of oil consumption and the extension of oil drain intervals1. This advanced oil is part of ExxonMobil comprehensive range of high performance lubricants and services which have been designed to help optimise the safety and productivity of mine site operations when compared to conventional mineral oils. At the La Herradura mine, located in Sonora Desert of Mexico, Construplan operates more than 40 pieces of heavy-duty equipment, including large trucks, heavy-duty pickups and excavators that rely on Mobil Delvac 1™ synthetic heavy-duty diesel engine oil. Along with heavy loads, the equipment at the mine is often subjected to extreme conditions - ranging from 50⁰ C (125⁰ F) in the summer to -10⁰ C in the winter (-14⁰F). Since implementing Mobil Delvac 1™ in its operations, Construplan has reported significant benefits, including enhanced equipment performance, increased uptime, improved fuel economy and extended oil drain intervals when compared to conventional mineral oils. As a result, Construplan leaders say they have been able to reduce oil consumption, minimise used oil waste, and maximise the overall productivity of their equipment and people. Mobil Delvac 1™ branded heavy-duty engine oils are part of comprehensive offer to the mining industry, which include Mobil SHC™ synthetic oil and greases, and Mobil DTE™ Series high-performance hydraulic fluids. These products are formulated to help mining companies achieve their safety and productivity related goals, and can deliver a range of performance benefits, including prolonged equipment life, improved energy efficiency and extended oil life when compared to conventional mineral oils. Mobil SHC™ 600 Series – These gear and bearing oils can deliver a service life up to six times longer than competitive, mineral oil based, gear and bearing lubricants. Also, in independent university laboratory testing, and statistically validated field tests, the Mobil SHC™ 600 Series Series have demonstrated their ability to deliver an energy savings of up to 3.6 percent2. Mobil DTE 10 Excel™ Series - High performance hydraulic oils that provide long oil life and help minimise deposit formation in severe hydraulic systems. 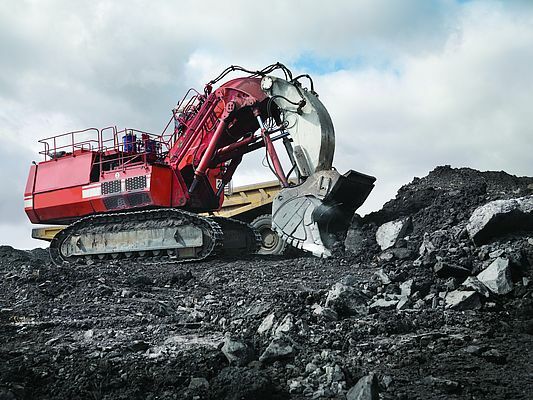 In addition, in controlled laboratory efficiency testing, Mobil DTE 10 Excel™ Series was measured to provide up to a 6 percent3 improvement in hydraulic pump efficiency compared to standard hydraulic oil, when operating in typical hydraulic applications. Mobilgrease XHPTM MINE Series – These Mobilgrease XHP™ 320 Mine and Mobilgrease XHP™ 681 Mine greases are specifically designed to meet the needs of off-highway and mining equipment that require lubricants which offer exceptional extreme pressure / anti-wear performance, and will remain in place even in tough conditions, including high sliding and high temperatures. Alongside its high quality lubricants, ExxonMobil offers its proprietary online oil analysis service, Signum™ Oil Analysis. Signum enables operators to proactively monitor the condition of lubricants and address conditions which have the potential to lead to unscheduled downtime and increased costs. 2- This proof of performance is based on the experience of a single customer. Actual results can vary depending upon the type of equipment used and its maintenance, operating conditions and environment, and any prior lubricant used. 3- Energy efficiency relates solely to the fluid performance when compared with conventional reference oils of the same viscosity grade in gear applications. The technology used allows up to 3.6 percent efficiency compared with the reference when tested in a worm gearbox under controlled conditions. Efficiency improvements will vary based on operating conditions and application. 4- Energy Efficiency of Mobil DTE 10 Excel relates solely to the fluid performance when compared to ExxonMobil Lubricant and Specialities’ standard hydraulic fluids. The technology used allows up to six percent increase in hydraulic pump efficiency compared to Mobil DTE 20 series when tested in standard hydraulic applications under controlled conditions. The energy efficiency claim for this product is based on test results on the use of the fluid conducted in accordance with all applicable industry standards and protocols. In case of queries, please consult TechDeskEurope@exxonmobil.com. Results may vary depending on operating conditions.